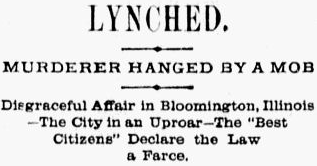 On this date in 1881, a mob of 5,000 shouting imprecations against the courts spent two hours breaking open the jail in Bloomington, Illinois, then hauled out a horse thief named Charlie Pierce* and lynched him to an elm tree at the corner of Market and Center. Pierce’s offense wasn’t so much the horse-and-buggy theft from a weeks prior — the crime for which he was arrested — as making an impulsive and extraordinarily foolish escape attempt that entailed grabbing the sidearm of a well-liked jailer named Teddy Frank and shooting him dead. Rushing to the scene, the sheriff disarmed an unresisting Pierce who perhaps was already beginning to apprehend the possible consequences his rashness would visit on him that very night. They weren’t, but according to a 2010 recap of the still-notorious Pierce hanging written by a McLean County Museum of History archivist, matters were exacerbated by the autumn by an Illinois Supreme Court ruling reversing the conviction of another Bloomington murderer. ** And Pierce’s end came just two weeks after the U.S. President finally succumbed to the bullet that a madman had pumped into him months before. A flash mob of infuriated citizenry had the jail surrounded by 8 o’clock, 90 minutes or so after Pierce shot Frank. These bloodthirsty local grandees ran up against — and in this instance prevailed over — the growing sentiment among respectable elites that such carnivals tarnished the majesty of the law. In some cases, that was pretty near the very point of them; hooting onlookers were reported to have shouted things like “Justice and the courts are a farce!” and “We have seen too much of court quibblings!” For any observer in his wits it was manifest that such hot blood would bend towards anarchy if given free rein. A police officer managed to cut down Pierce as the three-quarter-inch manila hemp gouged into his neck, but the miscreant was strung up a second time and “upon [the officer’s] attempting to repeat this act of bravery he came near being killed.” The fire department was summoned to disperse the mob with hoses but was also forced to retreat. And the area’s delegate to the U.S. Senate as well as a state’s attorney pleaded with the mob to let the courts handle Mr. Pierce. It’s the only lynching in McLean County’s history. * It transpired that Pierce’s actual surname was Howlett. He hailed from Mount Pleasant, Iowa. ** Patrick “Patsey” Devine, the beneficiary of that ruling, would be convicted again and hanged in 1882. He was feared in danger of joining Pierce on the lynch tree this night, but the mob gave him a miss.